Find Arizona pumpkin patches near Phoenix, Flagstaff and Tucson. There are three Phoenix pumpkin patches within Maricopa County. There are three Tucson pumpkin patches within an hour of the city. 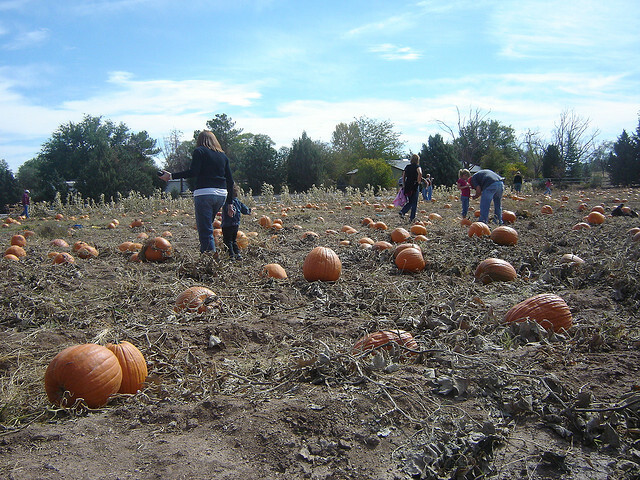 Flagstaff residents have fewer options but can still find pumpkin picking within a reasonable drive. Enjoy a day on the farm with your friends and family this fall, take a hayride out to the pumpkin patch, and pick out the perfect pumpkin to carve up. Indulge in the rest of the fall fun offered by your local farmer and end the day with a photograph to remember it forever. Beginning October 1st the pumpkin patch is open every day except Tuesday. A horse and cattle ranch from the 1950s that the Richardson family opened to the public in 1970. Take a horse or mule drawn hayride to the pumpkin patch. Other activities include petting zoo, hay maze, pony rides, gem mine, cowboy golf, carnival rides, face painting, and sand creations. Their address is 26540 N Scottsdale Rd, Scottsdale, AZ 85255. It is about 27 miles north of Phoenix. Open every day beginning October 1st. Wade Kelsall runs the farm his parents purchased here in 1968. They began selling pumpkins in 1991 and forty acres of pumpkins are now grown in Duncan for sale here. The Giant Pumpkin Weigh-Off happens in October. It appears that the pumpkins are brought to the Gilbert location. Other activities include hayrides, adventure maze, straw bounce and farmyard animals. Their address is 1663 E. Baseline Rd., Gilbert, AZ. It is about 20 miles east of Phoenix.